Ankylosing spondylitis symptom is about chiropractic management of AS. Ankylosing spondylitis symptom begins with pain and progresses with increasing stiffness initially in the SI joint; it's also known simply as AS. Pain and stiffness are common to a group of arthritic diseases that can cause inflammation in the spine, peripheral joints, the eyes, the skin, the mouth and various other organs. First and foremost this disease causes pain and stiffness in the joints, particularly, though not limited to, the spine; particularly the lumbar facet syndrome and sacroiliac joints. To muddy the waters, unfortunately lower back and buttock pain and stiffness are the most common symptoms of many other low back conditions. The young man with lower back pain spreading to the buttock, who doesn't respond to treatment, should have a test for the HLA B27 gene which increases the likelihood that the pain may be from AS. Women get it less frequently. 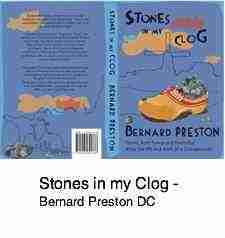 New … hot off the press STOP PRESS: Stones in my Clog my third Chiropractic book, written in the James Herriot genre, has just become available for the first time as an ebook for just $2.99, though Kindle seems to change the price at will. 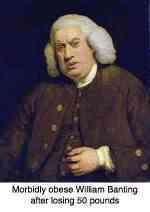 As with many pain syndromes we find patients with ankylosing spondylitis complaining of fatigue and malaise. Whether this is primary to the disease, or secondary to the pain, is difficult to determine. As with all diseases which come in serious as well as light forms, ankylosing spondylitis symptoms may be severe, or mild and irritating rather than disabling. The pain and stiffness usually begin gradually although, in the aggressive form, the onset of ankylosing spondylitis symptoms may be swift and remorseless. As with many lumbar conditions, to make matters worse for the diagnostician, the pain and stiffness is usually worse in the early hours. In fact, inactivity aggravates ankylosing spondylitis and it is usually worse after periods of rest. Whilst conversely, remaining active relieves the symptoms of ankylosing spondylitis, as it does with almost all joint conditions. From the chiropractic coalface; a 42 year old man, began developing vague symptoms of malaise and low back pain about two years ago. The pain gradually worsened, with his joints becoming stiffer, and walking became difficult. Blood tests revealed the presence of the HLA B27 gene; he was diagnosed with ankylosing spondylitis symptom. He consulted me for the first time about six months ago, eventually convinced by a friend who had had successful treatment at our clinic. Sitting was obviously uncomfortable and he walked in a slightly flexed, bent forwards, posture. Extension of his lower back was very painful. The signs, orthopedic tests, and symptoms of a typical sacroiliac joint anatomy syndrome were apparent; ankylosing spondylitis attacks the hyaline cartilage causing it to degenerate. Despite the positive diagnosis for ankylosing spondylitis, and lack of xrays at first, we decided to proceed with a limited period of treatment of his ankylosing spondylitis symptoms. Why? How is treating an HLA B27 patient justified with chiropractic help? The short answer is that there is zero research confirming chiropractic can help the patient suffering from this nasty disease. The other side of the coin is how many medical treatments have likewise no scientific basis. It's only time before a chiropractor researcher takes on this challenge. Ankylosing spondylitis just loves to attack HYALINE CARTILAGE ... What can you do about it? 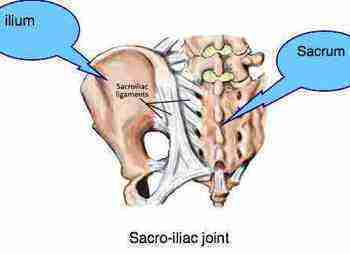 The pain and stiffness of AS mimics the pain initially of several other lower back and sacroiliac conditions. About 15 percent of the people carrying this gene actually get anklylosing spondylitis symptoms. Some additional environmental factor, probably in the diet, is needed for persons with the gene to get the disease. Thus it's only a predisposition, and well to be remembered, that 85 percent of persons who are carriers of the gene do not get ankylosing spondylitis. The gene is inherited obviously, but so indirectly is the diet, and propensity to exercise, or not to exercise, handed down from family to family. So families who do not know about anti inflammatory foods are obviously more predisposed to get the disease, and this is passed onto their children. What adds to the confusion is that some people with known ankylosing spondylitis symptoms do not have the this gene. So, what happened to him? He responded just like any other patient to the usual chiropractic management of sacroiliac joint pain, particular with the use of the Thompson Drop table. Within six weeks of adjustments to his sacroiliac joints, and a vigorous rehab programme that I put every chronic low back pain patient through, he is almost painfree. True, it creaks and groans from time to time, but then so do most chronic backs; so he comes in now once every 6 weeks on our maintainance programme, just like a chronic diabetic or high blood pressure patient would with medicine. An exercise class benefits arthritis too. One of the characteristic features of the disease is morning pain relieved by movement. After an hour or two of moving about the pain and stiffness is lessened. In other words, movement in the affected joints lessens the pain and stiffness. This is why chiropractic does help; the adjustment and exercise program put movement into the painful joint, increasing the movement of synovial fluid through the joint. Anti inflammatory foods may be the reason why some people with the HLA B27 gene do not develop ankylosing spondylitis symptom. There is an abundance of research now being done of the way in which certain herbs, fruits and vegetables have phytochemicals that block the cox enzyme in the same way that anti inflammatory drugs do. They are far milder, with a less immediate powerful effect, but also without the serious side effects that these medications have. Taken on a daily basis, olive oil for example and herbs such as sweet basil, have a steady anti inflammatory effect on the body. More, most seed oil salad dressings are very high in omega 6 fatty acids which, if the omega 3 is low in the diet, has a profound inflammatory effect. Changing to olive oil reduces the omega 6 to 3 ratio, which is vastly beneficial. It takes only five minutes to make pesto in your own kitchen, using primarily olive oil and sweet basil, making it a top anti inflammatory food. Including foods to reduce inflammation on a daily basis in your diet is the only way to prevent these nasty autoimmune diseases. Update: Two years later: Mr S comes in every two months for an adjustment of his spine and pelvis. He's having almost no trouble, can walk normally, though I keep having to badger him to do his exercises when he has no pain. Ankylosing spondylitis symptoms are not something you mess with. Take it seriously. Choosing the right bed if vital for you, not just if you are suffering from ankylosing spondylitis symptoms but for everyone. Unfortunately, "one size fits all" is a myth. The bed that's right for your back is about as personal as the right shoe, the right car, the right orthotic in your shoe. Never was I so forcibly reminded of this, as when we went to our annual timeshare in the mountains and from the second night I woke up every morning when terrible backache. Within an hour of doing my lower back exercises I was fine. My wife was unaffected. On returning home, my back was fine. Last year, we returned to the same resort. Same story. The bed was just too hard for my back. This website gives some excellent advice on choosing the right bed: Best Rated Mattress. Discover what is the best mattress brand for you, the most popular type of mattress and how to find a mattess that will give you a fantastic night's sleep. Many foods are known to have anti-arthritic properties, and so I put Mr S on a diet based on more "basic" foods. Basic = non-acidic. Salads, fruits and vegetables. It's important if you want to avoid Ankylosing Spondylitis symptoms. Think of the simple things like these interesting facts about strawberries and the benefits of a fish soup and an olive garden salad recipe. Interesting new research from the University of Illinois proves that people on high 'soluble fibre' diets are far more immune to disease and heal more quickly ... read more at Alternative Medicine Research. Ankylosing spondylitis symptoms of pain and stiffness are not unique to AS. 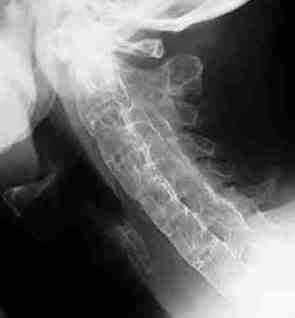 Before anyone accuses me of taking poor quality chiropractic x-rays, these were eventually taken at the local hospital! Nevertheless, the pattern is clear. 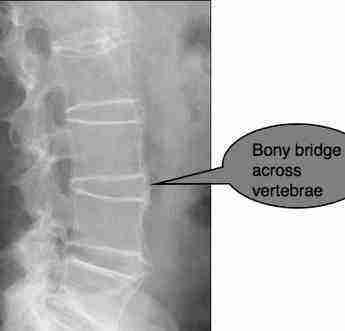 Mr S does indeed have AS, but withOUT Ankylosing Spondylitis symptoms. Exercise class benefits arthritis, too, remember. There are three basic medical approaches to degenerative joint pain; replace the joint if that's humanly possible, fuse it or take anti inflammatory tablets. 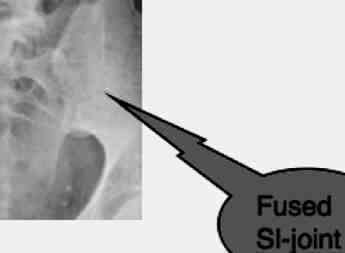 The fusion might mean taking bone chips from elsewhere and securing a total fusion, plates and screws or it could mean using a corset. All of these have their merits and and some decided disadvantages. Naturopathy and chiropractic have a totally different approach in the care of ankylosing arthritis symptom; our first step would be to increase the mobility of the structures using specific exercises for sacroiliac joint pain. Ironically there is plenty of medical research confirming that exercise class benefits arthritis. Chiropractors would then use a variety of techniques to mobilise the joint; that might mean an activator tool, a drop table and specific manipulations. One or other might be more appropriate in your case. And then the anti inflammatory diet mentioned elsewhere. Oddly red hot chilies would be on the list. 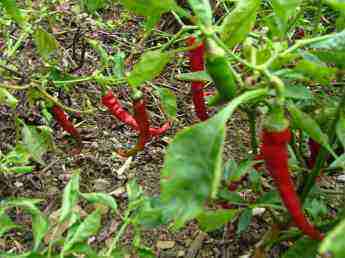 They are very easy to grow in your own garden and very pretty in any flower bed. 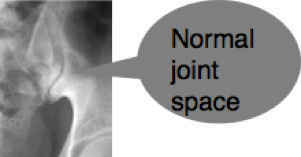 The word 'ankylosis' is defined as abnormal adhesion and rigidity of the bones of a joint. That's precisely what happens in severe cases of AS. The joints turn to concrete. 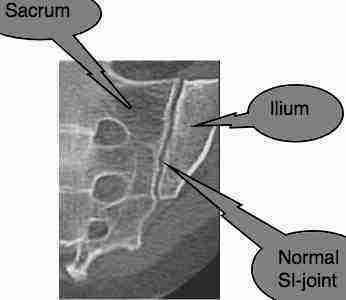 The facet joints may fuse, you can see the ligaments running to the front and back to the spine have calcified (become loaded with calcium, effectively turned to bone) and large spurs called 'syndesmophytes' join the bones. Concrete, or as it is known, Bamboo Spine. So, what's the future? Is he going to get bamboo spine? No one knows, but at the moment we are cautiously optimistic that if he keeps up his exercises and eats the right diet he has every chance of avoiding the nasty symptoms of this disease. Yesterday we had a consult with his wife over a change of diet, and he now comes in occasionally, but regularly, for his chiropractic adjustments. Certainly he is convinced! He has minimal pain, and can walk normally again. Obviously the sooner the patient consults a chiropractor the better chance of a good result. Once bamboo spine has set in, it's concrete. Remember, this is just an anecdote about ankylosing spondylitis symptoms. There just are no long term studies on the management of this nasty condition with chiropractic. Did you find this ankylosing spondylitis symptom page useful? Then forward it to a suffering friend. Frankly, despite having been labelled as an ankylosing spondylitis patient I think he has only a mild form. All conditions, be it blood pressure, diabetes or a slipped disc come in a range from severe to mild. What turns mild to severe? No one is sure, but the suggestions are that a diet low in omega 3 and a sedentary lifestyle is likely to be a large part of the problem. Along with the general dietary suggestions concerning arthritis there is considerable evidence that you can get relief by eating certain spices like turmeric and herbs like ginger for arthritis. Think too about how an exercise class benefits arthritis. If you really are serious, anatomy books will help you too. Have you started plans? Just what are you going to do once you quit work? Be sure of this: if you have nothing better than getting up late, reading the paper, a few games of golf... then you probably won't last more than a couple years. Amongst other things, think about a thiamine deficiency.